Vinayaka's Kitchen: Howdy, I’m back! How wonderful it is to attend the first official blogger meet? Can I describe in words? I want to do it badly. So here I am, to share my first official blogger meet experience with my dear ones. My hubby is the one who introduced me to this blog-o-sphere and helped me find many wonderful friends. And I have heard a lot from my hubby about blogger meets and its atmosphere where we can meet and interact with light minded people. As soon as I landed in Bangalore, I was eagerly wishing for a meet. When I got an email from IndiBlogger announcing #Immunity4Growth meet; I shouted in excitement. It was much like my mood to watch first day first show of Super Star Rajinikanth’s movie. Best of all was the confirmation messages I received from IndiBlogger team. So sweet of them! Like a neonate, in Bangalore, I held hands of my hubby and walked with him from MG Road to all the way to Taj Vivantha. The walk was full of fun. Finally when we reached the hall, my hubby and I, received a warm welcome by IndiBlogger Team. I was surprised, literally! As my hubby, Sarav, is a blogger from 2009, a few people recognized him and greeted him. He introduced me to them as his wife and as a food blogger. We took juices and made our way to the second last table. 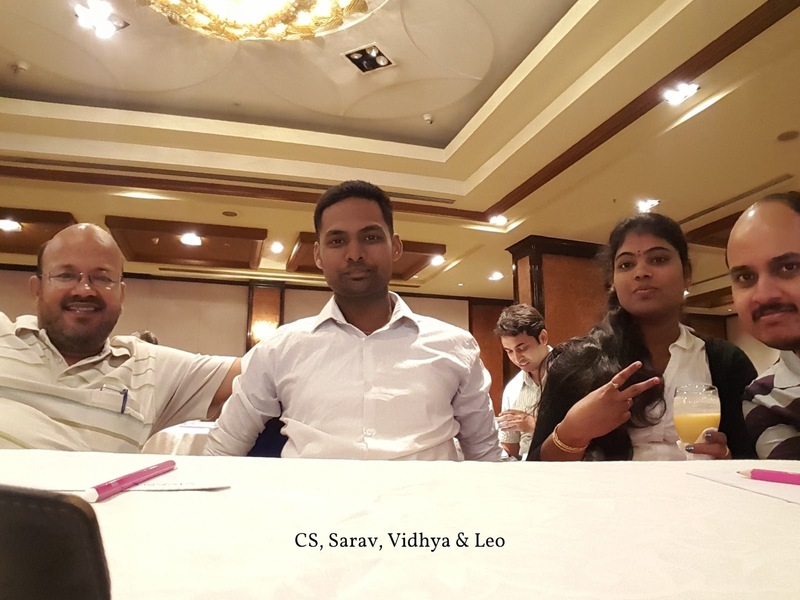 I was eagerly waiting to meet my dear blogger friends (Suresh anna & Vinay bro – he gave me the name VV – I am so happy for it.) My hubby called them on mobile phone and in about five minutes they came. I felt so excited to meet them after three long years. I came to know from my hubby that Anoop was the anchor (I always wanted to become an anchor). He anchored very well but I felt bad was the short introduction timeline given to the bloggers. At least they should have let the first time bloggers to speak. I prepared so much to speak, but only 5 to 6 people was asked to speak. I got bit upset. Guess Vinay bro noticed it, so he helped me inviting for coffee. Also there were many people whom I do not know and I badly wanted to discover new bloggers, but due to the lack of introductory session, I felt really bad. Jill Castle then took the stage and spoke about deficiency and immunity problems in India. It was an enlightening session. She also gave a few important tips like overheating raw milk or heating multiple time will decrease proteins. Later she spoke about numbers (I am not good at numbers :() in India and explained the role of Horlicks in the growth of children. Horlicks, being my favorite, I shouted whenever there was an opportunity to say TALLER STRONGER AND SHARPER. Grow Healthy inside to grow stronger outside. We had a quiz, which was fun. Though we did our best, still we got only three answers correct. We had our share of fun. We clicked group selfie and as usual planned for the next meet. Once the meet was over, we were invited to have dinner. Being a food blogger, I tried to taste as many times as possible. I liked Chicken Gravy and Naan with Palak the most. I shall soon prepare it in my kitchen and post it online. While we were having our dinner, we met Sabby (Sarabjeet Singh, my hubby’s friend) and a few other bloggers. They are really talented and I am looking forward to network with them. Though we spoke a little as everyone was busy talking and eating, still it was good compared to nothing. While returning home we received gift hampers from Horlicks. I felt happy. And on the way to home we enjoyed the Bangalore weather. We had been in Germany for three years. Though it used to be cool, still it lacked the romantic air, which I find in Bangalore. I am promising to be regular from today.